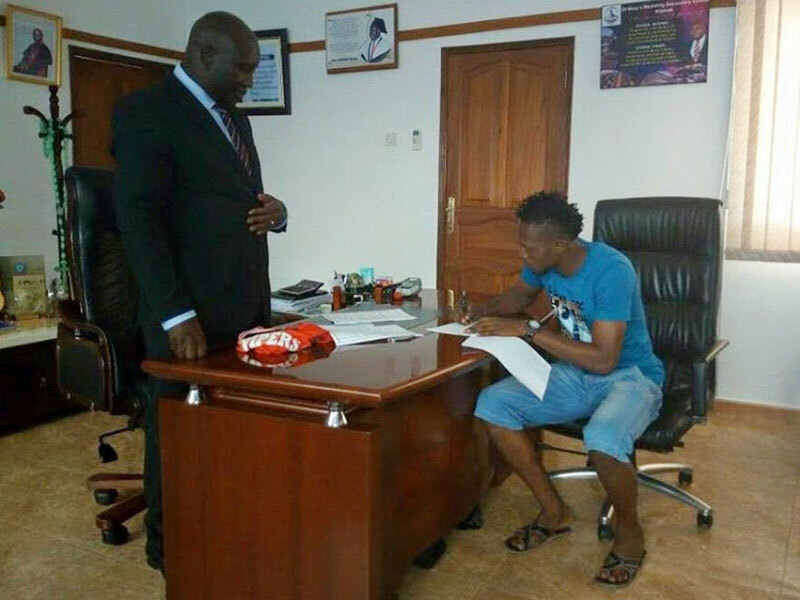 Mbayo puts pen to paper at Vipers director Lawrence Mulindwa’s office on Tuesday. Courtesy. FOOTBALL — Vipers SC have acquired the services of Congolese forward Clovis Moussa Mbayo for undisclosed fee on a three-year deal. Mbayo signs from Congolese club Saint Etoi Lupopo based in Lubumbashi. Sources indicate that the player’s representatives had for some time held talks with Vipers SC technocrats. And the Kitende-based side have today confirmed that the striker has joined the club ahead of the 2017-18 season with the Congolese becoming Vipers’ fifth major signing. He follows Tadeo Lwanga from SC Villa Yayo Lutimba from Express, Tom Masiko from KCCA and youngster Steve Mukwala from Edgars Youth Academy. A powerful, pacy striker, the highly coveted Congolese moves to St Mary’s Stadium having developed a reputation as a fine finisher at Club Saint Etoi Lupopo. Skillful and with audacity to beat opposing defenders with quick feet, Mbayo is a threat in the air and also comfortable holding the ball up and linking up play, at least for those who have seen him playing. Vipers, who finished third last season, had earmarked Emmanuel Okwi as their priority target to add verve to their seemingly feeble frontline, but the eccentric striker sought for greener pastures and rejoined Tanzanian giants Simba following completion of his six-month contract with SC Villa. Mbayo is expected to partner madcap forward Tony Odur in search for goals next season.